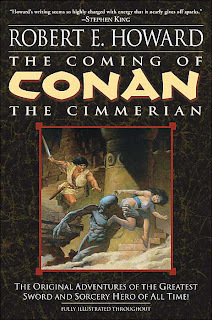 The stories in The Coming of Conan the Cimmerian reflect the rush of a writer staking his claim to a literary world of his own invention. The style is thick and muscular, simultaneously (as Will said in his review) primitive and sophisticated (my favorite line: "He smote him with the beef bone."). Much as Tolkein did for epic fantasy, Howard set the initial bar so high that few have equalled, let alone surpassed what he accomplished. I appreciate the sentiment of the post, but I have a few corrections to make. First, Howard certainly did travel. He is known to have visited New Orleans, and Santa Fe and Carlsbad in New Mexico; in Texas alone he visited San Antonio, Austin, Fort Worth, Galveston and Rio Grande Valley. That's quite a range. Secondly, Conan is clearly a man made of sterner stuff than most. His wounds and injuries don't show because he's healed: he's a tough adventurer born and bred in the harsh wilderness. Look at all the old soldiers and adventurers in the world who were almost as fit and vital in their middle and even old age as they were in their youth despite suffering injuries and the like: Conan couldn't have survived as long as he did if he was still suffering nagging wounds and aches. Howard clearly knew the effects of injury on the human body: his father was a doctor. But a Conan wincing from old wounds is a Conan who wouldn't survive the adventure, where life or death is on a hair-trigger. Then there's the assertion that men are "either good or evil": well, I can't say I agree. What about sympathetic villains like Khemsa, evil allies like Pelias, and neutral characters like Taurus and Nestor? Even considering the evil characters, they have perfectly reasonable motivations for their actions beyond "being evil for the sake of it." Finally, the simplification of the women in the Conan stories is also very facile. If all a woman is judged by is "how beautiful they are, and how quickly Conan gets them", then how does one judge, for example, Zelata in The Hour of the Dragon? Conan certainly doesn't bed every girl in the stories, in fact, in many the idea of Conan bedding them doesn't even come up. I'm sorry you can't see the women as "real human beings," since I think Howard's best female examples are at least as well-rounded and nuanced as the Cimmerian himself. 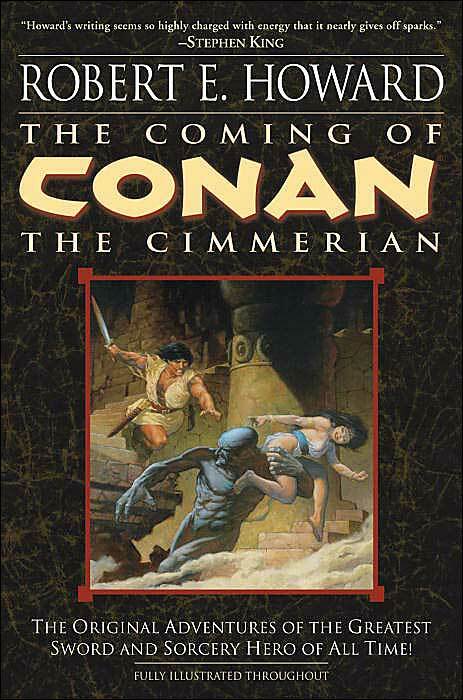 I think Howard's Conan stories are rich enough with sophistication and depth, personally. It's all there: you just have to look for it. There's no guarantee Howard's work would've improved had he lived: for all we know, his creative juices could've been sapped, and he became a doctor instead. But these games of "what could have been" are all subjective, and given the great stuff Howard did leave, I think there's plenty to ruminate on, rather than muse on possibilities. Robert E. Howard is fascinating. Thanks for reading, and for taking the time and effort to craft such a detailed response. Clearly you've spent an awful lot of time reading and thinking about Howard's work. I think we'll have to agree to disagree on most of your disputed points, though. Howard is fascinating, isn't he? Have you seen the film, "The Whole Wide World?" It's a biography of Howard's later years.